Now, I´m not laying claim to this being the most authentic of Spanish tortillas. For a start, the most famous is the potato one, sometimes with onions added. Secondly, the potato is cooked from raw in a fairly significant amount of olive oil, very slowly until tender. It´s wonderful, but when I´m at home I try to cut out a few calories and this is how I make my tortilla. To be honest, no one seems to have noticed the lack of oil! So, for one person, this is what I use, just multiply the ingredients for more people and of course, use a bigger pan! This makes a tortilla large enough for a decent supper or light lunch, served with salad, bread and of course a glass of wine. Start by putting the oil into the frying pan and then chopping your potato into small chunks. Also add the vegetables if using. You want the potatoes and vegetables to fill the pan almost to the top. Warm them through turning them over gently so that they are all covered in the oil for a few minutes. In a bowl beat the eggs, seasoning and milk with a fork then add the potato mix to the eggs and mix it all in gently with a spoon. You should have a little oil left in the pan, but if not a tiny splash extra will be sufficient. Pour the egg and potato mixture into the pan, turn the heat down to the lowest setting, put the lid on the pan and then leave the bottom half to cook slowly. Depending on how large your tortilla is, this could take a while. The two egg tortilla takes about 10 minutes. Every so often, press gently on the sides with a wooden spoon or spatula to see if it is browning underneath. When it is a lovely golden brown and the top is set, it´s time to flip it over! You can use a plate, or two plates (tip out onto one plate, invert onto another and then back into the pan). I have a plastic tortilla “flipper” which has a small handle underneath. You turn the tortilla onto it then slide it back into the pan. A flat saucepan lid would work just as well. Now turn the heat up a little, leave the lid off and cook for about another 4-5 minutes until the bottom has turned the same lovely golden brown. Leave it to stand for a minute or two once it is cooked, then turn it out onto your plate and enjoy. Thanks go out to JamieAnne at A Dash of Domestic for her wonderful tutorial on how to insert a slide show! That looks lovely – craving a tortilla now. Guess what I’m having for lunch?! It was indeed delicious! Go on, get those eggs out of the fridge….and thanks for the “visit”, lovely to see you here! Your slide show was great fun to watch – well done on getting it right. 🙂 I too have a couple of old pans that I just cannot throw out! Hope they make a tortilla as good as yours. Glad the slideshow worked – took me ages to upload the photos though 🙂 The old battered pots and pans are often the best. I still have some of my grandmother´s cake tins she must have got as wedding presents in the 1940s to make Victoria Sandwiches in – and they work fantastically! Aha! So, perhaps the difference between “tortilla” and “frittata” is the ratio of egg to “not-egg”? (grin) Looks beautiful… and the slideshow is *very* cool! Keep ’em coming! Who knows! My Italian aunties made frittata and each one did it differently too! Thanks for the kind words…. Aha – I had a great teacher! Links, slide shows… you do it all! Love this recipe. And it turns out so crisp and golden looking. Just working on the dry ice and disco lights and I´ll be set….! The slow cooking with the lid on does ensure a cooked through tortilla with a golden outside. It really works! That looks delicious! We have a wooden version of your tortilla turner, bought in Navarra. I always think it looks like a wooden beret, but it’s very useful. Now I’m going to see if I can find out how to put a slide show in my posts! Your turner sounds much grander than mine – I´m jealous now! Do go to the tutorial on slideshows, it´s actually very straightforward to do and lets you put in plenty of snaps (and you always take such lovely ones). One of Big Man´s sisters also does this and I have to say, out of all the (many) sisters, her tortilla is the best. Maybe I should have more patience and give this a go too! It´s such an easy meal to prepare, and there´s always something lurking in the fridge to jazz it up! Use the lid method it really does work well! 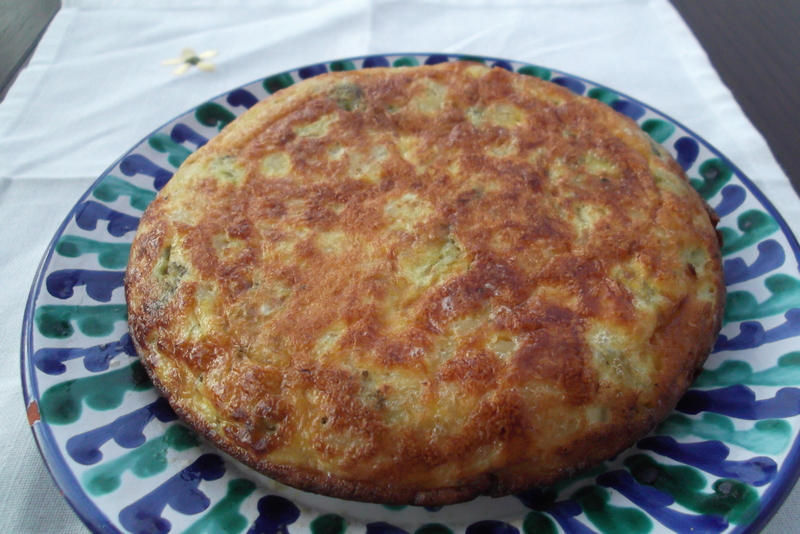 I think you´re right re the tortilla vs frittata thing – I don´t think there´s much difference in the way they turn out! And leftovers are perfect for these kinds of dishes…Do check out the slideshow link, it´s really straighforward. Flip and slide – I’m there! If you’re making a large one and you’re not confident flipping it – stick it under the grill for a few minutes to firm up then flip!